TACLOBAN CITY – Fourteen athletes of the Leyte Sports Academy have qualified to compete in the newly revived Batang Pinoy 2011 after they garnered gold and silver medals in the Batang Pinoy Visayas Leg in Dumaguete City last November. Former board member Rowil Batan who now heads the Leyte Sports Academy of the provincial government says LSA’s sports scholars earned spots to compete in the National Batang Pinoy 2011 to be held in Naga City, Camarines Sur on December 10-13. Batan said this would be a good exposure for the athletes to compete in the national level and be able to compete with athletes who have undergone trainings abroad. “We have fairly raw sports talents at the academy now as we have just started more than a year ago. Competitions such as this will be a very good exposure for them. We are just thankful that they earned spots to compete in the national level,” Batan said. Though he hopes the athletes to do well in the upcoming Batang Pinoy, the LSA management is not expecting much for a medal haul considering the other contingents have years of training to back on way ahead of the LSA athletes. Leyte Gov. Carlos Jericho Petilla meanwhile assured support to the athletes’ bid in the Batang Pinoy 2011 event saying he is proud the athletes are doing well in their recent respective competitions. LSA athletes figured well in the Leyte Provincial Meet 2011 in Alangalang and is also looking forward to a good medal standing in the EVRAA Meet next year. To further strengthen the country’s sports development program, the Philippine Sports Commission (PSC) revived the Batang Pinoy. After being shelved for eight years, the Batang Pinoy has been designed to discover athletes 15 years old and below. The Batang Pinoy 2011 is held in partnership with the Department of Education (DepEd), Department of Interior and Local Government (DILG), and the Leagues of Provinces, Cities, Municipalities and Barangays. The Philippine Olympic Committee (POC) and the various national sports associations run and oversee the technical management of the event. Unlike the school-based Palarong Pambansa, the Batang Pinoy caters to out-of-school youths through the joint effort of the PSC and the host local government unit. High performing athletes in Batang Pinoy 2011 shall undergo high-level training for three years in preparation for the second Youth Olympic Games in Nanjing, China in 2014. Batang Pinoy 2011 is supported by Smart, Maynilad, Summit Natural Drinking Water and held in cooperation with MILO, Jollibee, The British Council, Standard Insurance and Negros Navigation-Super Ferry. Young athletes representing their provinces, cities or municipalities will compete in archery, arnis, athletics, badminton, 3-on-3 basketball, boxing, chess, judo, swimming, table tennis, taekwondo, tennis, weightlifting and wrestling. MALACAÑANG – Executive Secretary Paquito N. Ochoa Jr. on Tuesday underscored the importance of local government units (LGUs) as strategic partners of the Aquino administration in national development and in equitably distributing its benefits. While the administration is still finalizing the details of this national-local partnership program, Ochoa noted that its components essentially involve the following: (a) Projects that strategically link localities with national and global markets such as construction of ports and airports, and the development of information communication technology portals; (b) Projects that create economic enterprises such as “bagsakan” centers, food processing centers, and postharvest and storage facilities; and (c) Projects that promote tourism. PASIG CITY – Department of Health Sec. Enrique Ona is on the hot seat as the only political party for lesbian, gay, bisexual and transgender (LGBT) Filipinos, Ladlad Partylist, calls on the DOH head to resign for his irresponsible statements. The Ladlad group was left aghast by the DOH head’s discriminatory statements. “Sec. Ona should be prudent with his remarks. I am personally asking him to act befitting his stature as a medical doctor and head of the DOH.” said Ms. Bemz Benedito, Ladlad chairperson. “He should resign from his post, because bigotry and insensitivity has no place in public service specifically for high-ranking officials,” Benedito added. “Now, I presume that Sec. Ona is becoming senile and can no longer confront what is right and what is wrong,” Benedito said. “I would like to remind the good secretary that his proposal is a violation of our human rights as to our right to privacy and of choice,” the Ladlad chairperson added. “We should all be very compassionate in dealing HIV cases, no matter how alarming it is,” Benedito stressed. Ladlad said, the Health Secretary’s comment was not at all helpful in a time of crisis. In a recent survey, the Philippines is one of the seven countries worldwide that is experiencing an acceleration in the spread of the HIV epidemic. The latest HIV and AIDS Registry (September 2011) recorded 8 new HIV infections a day – a steep increase from the one case a day that was reported four years ago. Moreover, there is another major setback as the Global Fund to Fight AIDS, Tuberculosis and Malaria cancelled Phases 1 and 2 of its Round 11 funding for 2013-2017 – a $2-billion dollar worth of funding which would have saved a lot of lives here in the Philippines. Ladlad is also calling on the government to find a way to resolve the problem quickly because People Living with HIV (PLHIV) are dependent on free medicines given through the Global Fund. Part of the Platforms of government of Ladlad is to set up testing centers for HIV/AIDS in major cities in the country. The group has now more than 50,000 members all over the Philippines and will run as partylist in 2013 elections. QUEZON CITY – Human rights advocates in Southern Tagalog (ST) headed by Karapatan-ST expressed condemnation to what has happened yesterday when police forces brutally dispersed mostly youth protesters geared for “Occupy Mendiola”. “It is ironic for such a clear-cut violation of human rights to happen exactly during the Human Rights week and days before our commemoration of United Nation’s International Declaration of Human Rights,” Glen Malabanan, deputy secretary general of Karapatan-ST stressed. She said that this only shows how the Aquino government blatantly disrespects the people’s just demands and is no different from the previous Arroyo administration’s use of state fascism as the only answer to the people’s grievances. Karapatan-ST together with Bagong Alyansang Makabayan (BAYAN-ST) and other militant groups in the region are currently in their 3rd day of the Human Rights Cultural Caravan. The caravan has arrived two days ago in the provinces of Quezon, Batangas and Cavite and will now proceed to Laguna and Rizal. On Dec. 9, the caravan is to set-foot and culminate in Mendiola to expose the human rights violations of Aquino’s Oplan Bayanihan counter-insurgency program. “We are doing our part here to educate and uplift the political consciousness of the people with regards to upholding their basic human rights and yet we see that Aquino and his state forces themselves are ignorant to such rights,” Malabanan added. Meanwhile, Leo “XL” Fuentes, secretary general of BAYAN-ST expressed similar sentiments to what had happened in Morayta yesterday, saying that the 1987 Philippine Constitution clearly states that the people have the right to air their grievances to the government whenever they deem that it is no longer able to address societal concerns. “What should Aquino expect from the people when just less than 2 years into office, we have already seen the biggest cuts in budget for social services – such as education and health – in Philippine history?” he asked. Fuentes narrated the various human rights violations in Southern Tagalog on different sectors which includes land-grabbing and land-use conversion in rural areas; union-busting, low wages and contractualization among workers. The region has also experienced 13 political killings under the Aquino regime which includes Celito Baccay, union leader of the Solidarity of Cavite Workers, Kenneth Reyes, baranggay captain in Lemery and Chairperson of BAYAN-Batangas, Caloy Rodriguez, union leader of Calamba Water District and even a youth-leader, Lester Barrientos from the Southern Tagalog Cultural Network. “If Aquino will continue with this character of violence to those who are yearning for genuine change, it won’t be long before the people will wish him behind bars – just like Arroyo – for perpetuating this culture of impunity,” Fuentes stressed. Simultaneous with the cultural caravan is the 5th day of the hunger strike of political prisoners in Camp Bagong Diwa, Bicutan and Batangas City Provincial Jail. The hunger strike aims to press Aquino’s government to drop all fabricated charges and free the all political prisoners in the country 51 of which are from the Southern Tagalog region. CALBAYOG CITY, Samar – Agrarian reform beneficiaries at Panoypoy Agrarian Reform Community got an early Christmas treat from House Committee on Agrarian Reform members Representatives Pryde Henry Teves and Nasser Pangandaman. The two congressmen visited Panoypoy agrarian reform community (ARC) during their recent trip to Samar province for the congressional hearing on House Bill 374 (Genuine Agrarian Reform Bill) held in Calbayog City. Former Agrarian Reform Secretary now “AA KASOSYO” Party List Representative Pangandaman pledged P100,000 assistance to a cooperative composed of agrarian reform beneficiaries (ARBs) as he and Representative Teves (3rd District, Negros Oriental) side-tripped to Panoypoy ARC prior to the start of the hearing in the afternoon of November 17 with the Bill author “Anak Pawis” Rep. Rafael Mariano. The amount will be utilized for the Panoypoy Multi-Purpose Cooperative, Inc.’s livelihood activities particularly on vegetable production to raise the income of every ARB household here, Mr. Jose Alsmith Soria, DAR-8 Information Officer said. The cooperative was required to submit a proposal before the amount will be released, Mr. Soria added. At present, Development Facilitator Raul Monforte disclosed that the average annual household income in this ARC is at P58,000 which is below the poverty threshold. For his part, Rep. Teves, chairman of the committee on agrarian reform in the Lower House, called on the members of the cooperative to submit resolutions requesting funding for projects that would help improve the lives of the farmers particularly the 62 ARBs in this area. Teves instructed the ARBs to submit all these documents to his office in the House of Representatives as soon as possible to be included in the agenda of the committee’s next session and eventually get funded under the current fiscal year. Among the problems presented by the cooperative and prayed that these get funded are road opening in the interior-most part of Barangay Panoypoy to hasten the transportation of the farmer’s products for trading; and the upgrading of water supply facility in the area from level-1 to level-2. From Barangay Panoypoy one has to take two rides with a total fare of P40 in reaching the city proper, which is 24 kilometers away. Regional Director Eliasem Castillo of the Department of Agrarian Reform (DAR), who accompanied Teves and Pangandaman, was happy with the latter’s visit to the ARC as it turned out to be beneficial to the ARBs. Castillo directed Provincial Agrarian Reform Officer (PARO) Gregorio Fiel Jr. to provide the necessary assistance to the ARBs in coming up with the required proposals and resolutions before the deadline set by the congressmen. According to him, these are opportunities that we must grab in improving the quality of life of the CARP beneficiaries. Meanwhile, Castillo likewise presented the accomplishments and balances of CARP implementation in the region under its three program components – Land Tenure Improvement; Program Beneficiaries Development; and Agrarian Justice Delivery, during the hearing as the committee also assesses the status of program implementation in the country. "Just came from Calbayog court. The prosecution wants Ericson transferred to the Catbalogan Jail (near the headquarters of the AFP's 8th Infantry Division), even if all his hearings will be in Calbayog. They fear that Ericson will be rescued by the NPA if he stays in Calbayog. Jail security is tight. There is an army squad camped out literally outside the window of the prison receiving area where we met. CHR Calbayog says it will look into the AFP detachment beside the jail." The FEAC demands the pull out of the highly irregular, if not illegal, military deployment at the Samar sub-provincial jail in Calbayog, a civilian detention facility. According to Acosta, a platoon of soldiers from the 87th IB were first deployed in the nearby barrio since July in the pretext of military operations. Today, a squad from the 14th IB loiters inside the facility’s premises listening in to Acosta's conversations with visitors. The military troops also impose on the guards to show them records of prison visitors. The troop deployment and overkill security arrangement during Acosta’s first court appearance where he was made to ride the jail vehicle as a lone detainee in the midst of soldiers in full battle gear “are symptoms of one affliction." “Fascism is the most dangerous type of paranoia,” Acosta said. Acosta is scheduled to appear in court on December 8, 2011. His counsel, a group of lawyers from the National Union of Peoples’ Lawyers, will once again move to defer proceedings pending the DOJ’s decision on Acosta’s review petition filed last September 1. The motion to transfer custody of the Acosta is also scheduled to be heard, but the NUPL has yet to receive a copy of the motion. Instead of wasting government and military resources with Acosta's security arrangements, the FEAC reiterates its appeal to the Department of Justice (DOJ) to withdraw fabricated charges of illegal possession of explosives lodged against him, and to effect Acosta’s release from detention immediately. “Malaki ang aking pag-asang bibigyan aksyon ng DOJ ang kaso ni Ericson. Manalig tayo dito," said playwright Malou Jacob who as Executive Director of the National Commission for Culture and the Arts (NCCA), personally appeared at the DOJ to support the filing of Acosta’s review petition. “Sawang-sawa na ako sa kalaboso!” Acosta said in support of CampoutPH which will commence today at the Mendiola Bridge in Manila. Among those who initiated the House Resolution 1956 are Teddy Casiño, Neri Colmenares, Rafael Mariano, Luz Ilagan, Emmi de Jesus, Raymond Palatino, Antonio Tinio, Emil Ong, Philip Pichay, Bernadette Herrera–Dy, Susan Yap, Pryde Henry Teves, Florencio Noel, Nelson Dayanghirang, Florencio Flores Jr., Benjo Benaldo, Carol Jayne Lopez, Vicente Belmonte, Abigail Faye Ferriol, Rommel Amatong, Joselito Mendoza, Benhur Salimbangon, Nancy Catamco, Fatima Aliah Dimaporo, Joseph Victor Ejercito, Teddy Baguilat Jr., Benjamin Asilo, Winnie Castelo, Agapito Guanlao, Fernando Gonzalez, Rosendo S. Labadlabad, Pangalian Balindong, Acmad Tomawis, Marcelino Teodoro, Arturo Robes, Sherwin Tugna, Nur Jaafar, and Tupay Loong. Angie Ipong, secretary general of SELDA, said most of the 356 political prisoners, some 250 of them, were victims of political persecution under the Arroyo administration, as they were illegally arrested, tortured and detained under her rule. 78 are arrested and detained under the present administration. “They were charged with fabricated criminal cases to cover up their political persecution. Of this number, 13 are elderly, 43 are sick and 35 are women political prisoners. Pres. Aquino should heed this growing call for their immediate release for just and humanitarian reasons. 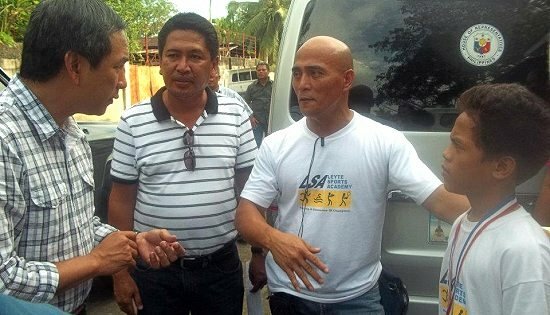 Like what he did last year with the Morong 43, he should grant the unconditional release of political prisoners this December,” Ipong said. b. The elderly, ailing and long-detained PPs who should be expeditiously released on humanitarian grounds, specifically Rolando Paniamogan, the Alegre family, Sandino Esguerra, and Mohamadiya Hamja. c. The remaining NDFP consultants in jail who are protected by the Joint Agreement on Safety and Immunity Guarantees (JASIG) and, based on the GPH Negotiating Panel’s commitment last February in Oslo to release most, if not all, political prisoners. Specifically they are Alan Jazmines, Tirso Alcantara, Randy Malayao, Edgardo Friginal, Eduardo Sarmiento, Leopoldo Caloza, Emeterio Antalan, Ramon Patriarca, Danilo Badayos, Alfredo Mapano, Pedro Codaste, and Edwin Brigano. d. *Hors de combat *Vanessa de los Reyes, a young woman NPA guerilla who is now paralyzed from the waist down after her spine was hit with a bullet. e. The 35 women political prisoners who are all vulnerable to sexual harassment and violence while in prison, in addition to what other PPs suffer. f. Ericson Acosta and Maricon Montajes, two artists from UP Diliman who chose to study and delve into the situation of farmers and articulate their plight through their crafts, are charged with illegal possession of explosives and firearms. Ipong also stated that political prisoners nationwide are now on their 3rd day of hunger strike and fasting to call for their immediate release.